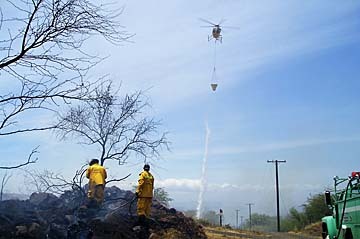 Maui firefighters put out a hot spot in a brush fire on the southern outskirts of the subdivision at Launiupoko yesterday as a helicopter assisted with a water drop. Maui girded for a third day of smoke, flames and traffic headaches from a brush fire that has already burned two houses and more than 1,400 acres south of Lahaina. Hundreds of visitors were expected to spend the night at emergency shelters due to the closure of the main road linking the Kahului Airport to West Maui, the location of resorts in Kaanapali and Kapalua. The brush fire flared up yesterday afternoon as gusts increased from 40 to 50 mph. 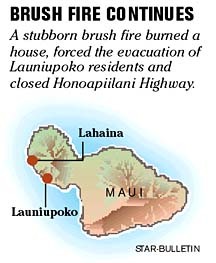 LAUNIUPOKO, Maui » A brush fire in West Maui flared up and spread to a new rural area closer to Lahaina yesterday, burning one house and forcing the evacuation of occupants in the Launiupoko subdivision. With smoke billowing off the West Maui Mountain slopes, the Valley Isle girded for a third day of closed roads and emergency shelters filled with hundreds of stranded visitors. County spokeswoman Mahina Martin said there are about 140 lots in the subdivision, but did not know how many homes or the number of people living there. The subdivision with two-acre lots was formerly used for sugarcane cultivation and brush occupies the perimeter and gullies of the development. Dozens of firefighters had spent much of the day trying to put out hot spots along the southern face of the subdivision, which rises hundreds of feet in elevation up the slopes of the West Maui Mountains. Banks and hotels in West Maui reported having no telephone service and computer service, said Maui Electric dispatch supervisor Ron Vincens. "It looks like the telephone cables are burned in Lahaina," he said. Meanwhile, the Federal Emergency Management Agency announced yesterday it is authorizing the use of federal funds to help fight the fire, paying up to 75 percent for eligible costs. County fire officials said they thought the fire was nearly contained in the early afternoon, but the blaze flared up as winds continued to accelerate, sometimes gusting from 40 to 50 mph, Martin said. Authorities closed west Maui roads near Launiupoko at 4:17 p.m. yesterday, Martin said. "With nightfall upon us, it just makes fighting the fire a little more challenging situation," she said last night. The brush fire, which started behind Chez Paul French Restaurant and was reported at 10:34 a.m. Wednesday, swept across more than 1,400 acres from Olowalu to Launiupoko in less than a day. Some eight people were displaced when a house behind the Olowalu General Store burned Wednesday. About 70 state and county firefighters, along with four helicopters, were putting out hot spots along a two-mile stretch of coastline, where the blaze sometimes climbed as high as 2,500 feet in elevation. Deputy Fire Chief Neal Bal said the wind was blowing in different directions on the slopes and firefighters were having difficulty predicting where the blaze was going. "This wind is playing havoc with us," Bal said. "It looks like it's going to be a long summer." Emergency shelters were again opened at the Lahaina Civic Center gym in West Maui and the Maui High School gym in Kahului. More than 550 people were stranded Wednesday night and forced to seek make-do accommodations either at an emergency shelter or at the Kahului Airport, as they missed flights or were unable to travel to their hotels in West Maui. Kapalua Airport accommodates only light aircraft and no night flights. Some 120 passengers on US Airways Flight 31 to Phoenix were unable to depart at 11 p.m. Wednesday, because their pilot was stranded in West Maui, said state transportation spokesman Scott Ishikawa. Ishikawa said the flight took off at 12:30 p.m. yesterday. British visitor Yvonne King, who stayed at an emergency shelter, said she and her three children spent an "uncomfortable" first night of their vacation on Maui but said Red Cross volunteers treated them well. "It was disappointing, but we've been looked after very well," she said.